It's Mom's Day Off but she's not feeling good and she's a little teary. I have to take care of her. Don't miss me too much, I'll be back. Dad just stepped out for a nice breakfast, I'm here with Mom while she tries to sleep in a little bit. Mom has to go to work today and Dad says he and I are going to be really busy. I asked him with what. He said he wants to clean out the backyard of poop - I have no objection to that; then he wants to work at cleaning out the spare room and do some work in the basement as well. DO you know what that means? That means I'll need to snoopervise all of this! I'm going to be exhaustipeited at the end of the day! I'd better nap now while I have the chance. 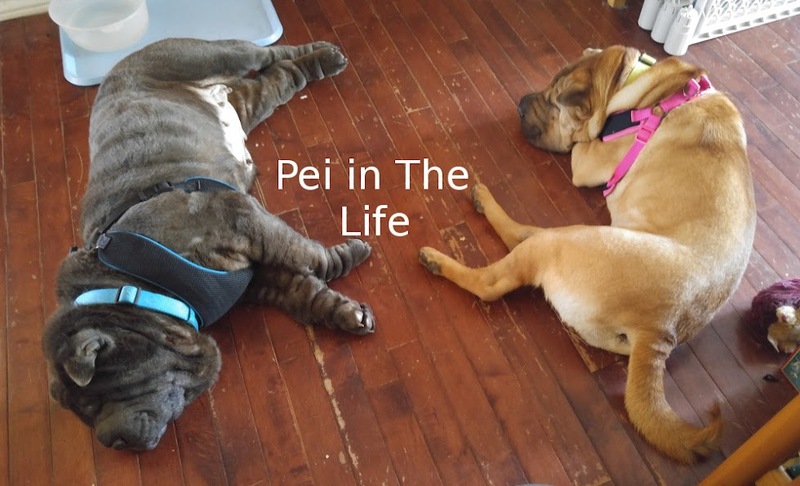 Pei-Ess, Great time at day care yesterday. The lady who filled out my pawgress report put little hearts by my name. I think she likes me. Yesterdays message said I was a cuddle pig and handing out big wet kisses. This was not news to Mom, go figure. I heard Mom make a phone call last night. Honestly, I didn't eavesdrop, I was sitting right there in the living room. I even tried to get her to hand me the phone, but she wouldn't. THis is what I heard. Mom: Hi, there how are you today?...... Bolo would like to go and play with you tomorrow ...... between 8 and 9 am .......... after 7pm ......see you tomorrow! Then she turns to Dad and says, they're very excited he's coming back. I think that means Day Care for me! I'm on my way ladies! I'll be there soon! And on a quick closing note, Mom thinks it would be funny to show everyone my fascination with evergreen trees. Yeah sure whatever Mom, as long as you pack my lunchbox! My investigating nose has been hard at work. While on my latest Adventure, I noticed something VERY important. My snow banks are gone! I think I've found a little bit of Spring! This morning I chased a squirrel! My first squirrel chase of this year! I'd better mark that on my calendar! I'd also better go cross train so I'm in shape for the next squirrel I get to chase. Remember a few days back I said we had gone on an Adventure and THEY had bought shampoo? I now know WHY they bought shampoo! The car is dirty! Don't worry, the car was stopped when Mom took the picture. And where were we Adventureing to? It's a tough job buy somepuppy has to do it. Pei laughter. I'm on he lookout for Spring. Mom says it's here but I haven't seen much of it yet. It's not as cold as it was, but I don't see any flowers or anything. I AM starting to smell squirrels though. I'm on the lookout for them too. Mom and I took our morning walk to breakfast. On the way to drop Daddy at work Mom started singing to me. She says the tune is from an old Girl Guide Song called Black Socks. But he just keeps telling me no no not yet not yet not yet. Mom said something about taking the camera out for a spin this afternoon. I hope she plans on taking pictures of ME. I haven't done any pei-fessional modelling in a LONG time. I have to update my pei-folio you know. Other than that, my plans for the day include a nap, a munch, some outside time and more napping. I have to conserve energy for the pei-fessional modelling shoot you know. Pei laughter. Mom and Dad took me on an ADVENTURE! And where was the camera? On Mom's desk. I'll have to look through the Bolo Photo Archives and come up with a nose shot for my fan club. Let me tell you about my ADVENTURE! First of all, I there I was not quite asleep in the computer room with Mom and Dad when Mom turns to Dad and says, want to go for a walk? I of course jump up and say YES! Dad said maybe later, but I said YES! and wagged my tail, they can't resist me when I wag my tail. So off we went to PetSmart. Mom said we needed poo. I don't know WHY we needed poo, the backyard is full of it. What? Shampoo? That's not poo? Oh, well, news flash, Shampoo and poo are two very different things. What is it Dad says? Important Safety Tip, Thanks Egon. Of course I had to say hello to all the ladies at PetSmart. I checked in on the hotel too, just to make sure they weren't missing me too much. Then we checked out a new little store next to PetSmart. It's called the Urban Market. I didn't go in but Mom and Dad went in one at a time to check it out. The only think I'd be interested in is the meat. They sell game meat. Buffalo, Elk, Venison. I want to try some! Mom and Dad didn't get any. Not this time. We'll be going back Mom says. Then we walked home. I was SO thirsty! Now I'm stretched out at the top of the stairs making sure my people are safe. It's a tough job I tell ya, but someone has to do it. Welcome to Bolo's Friday Weather Report and Other Adventures! dun da da da! It's really pretty but still chilly here at my house. mom and Dad were wearing their sweaters this morning when they took me for my ADVENTURE to pick up subs. 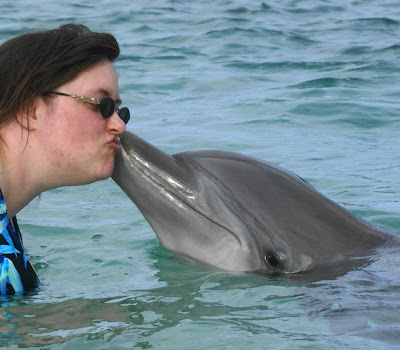 Yes yes, I've forgiven them for going kissy face with those dolphins from yesterday. You guys were right, they did come home to me and that's the important thing. 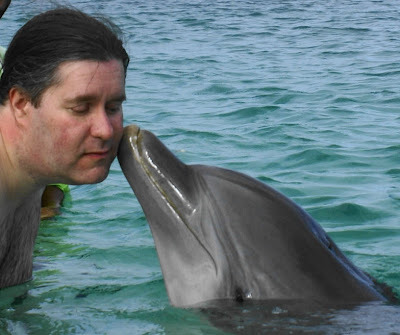 I'm so glad they didn't bring back a dolphin. Although, the only place they could put it would be the bathtub. We only have one bathtub. It would mean that I wouldn't have to take a bath. Hmmmmm. Is there still time to import a dolphin? Aunt Angela came over the other day and brought over a shiny thing with pictures on it. Mom and Dad looked at them and then I watched them when they were away yesterday. Look what I found! 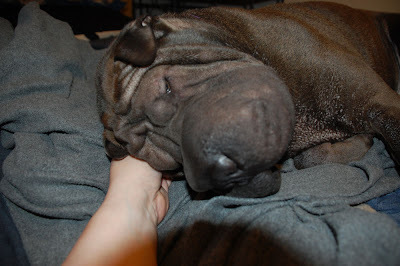 Mom says I shouldn't be angry because dolphin kisses are nothing like Shar Pei kisses. Oh yeah? Then why'd you need to go and get dolphin kisses? I'm going to sulk. And nap. Maybe things will look better after a nap. Mom says I've been Mr Super Cuddle Pig this weekend. Well, it makes sense because I had this horrible nightmare that I hadn't seen my parents in more than TWO WHOLE WEEKS. Wait a minute, that wasn't a nightmare. MOM! Cuddles! I need Cuddles! Ear scratches will do. Mom had to work yesterday but Dad stayed home with me so I could snoopervise his cleaning. Mom is home today so I can snoopervise her doing laundry. Mom came home from work yesterday and said she needed a walk. I decided to go with her, what a sacrifice. Pei laughter. Are there more cuddles in the offering Mom? Mom? What is it with blankets that Mom keeps thinking I need to be wrapped up? Hmm, it is kind of warm, smells like Mom and Dad. I think I hear a nap calling. We're all home together now. Oh it feels so good. Thank you to everyone who helped me get through this last little bit. I'm glad I had my DWB friends. No pictures of us together yet, Mommy is still downloading all the pictures so the camera is busy. What I think we really need is a family nap. They're talking about a family nap now. I gave them oodles of nose kisses they were so happy to see me. I was happy to see them too. My PetsHotel friends didn't want me to leave though. Mom read me the comments on Pawgress Report. Bolo is my Fav! He's cute for days! Bolo is always a blast! YOu can't help but love his attitude! He is so great! Anyway, it's good to be home. Is it nap time yet? Mom? Dad? Pee-mail from Mom! She said to think about packing up my bag. They're coming home! I knew if I was pathetic enough they'd come home. Oh my DOG! I'm going to have super nose kisses to give them when they get here. After I finish telling them off for being gone so long without me that is. Feather, Darla, Pappy, maybe you can hold off on the moving house. I may not need a rescue. Just when I had reached the subbasement too. Sigh. Gotta go, Sniff ya later! First of all, I noticed that I missed Aunt Sharon's Birthday. Happy Birthday Aunt Sharon! Nose kisses! Secondly, thank you all for your interest in coming to my rescue. I'm at the PetSmart PetsHotel near my house. Now I have been in communication with Grandma and Granddad, they say Mom and Dad are in Roa getting a Tan, and that there's a lot of water there so they thought I'd be more comfortable here at the hotel. I do have to admit that I don't like the water. I've been here too long though, shouldn't Mom and Dad by home by now? Don't they miss me? 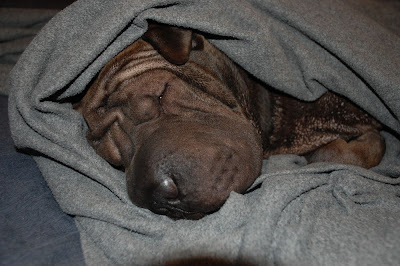 Feather, Darla and Pappy, bring on the house on wheels, we need to plan the Great Shar Pei Escape. Don’t worry about treats guys, it's a PetSmart, it's full of food. Oh, and toys for those of us not motivated by food. Mango had a good point though, this is a vacation and I should be relaxing. But my people aren't here! Now the ladies here do give me lots of smoochies and hugs, but I want my people. Oh, look what Mom sent Granddad. 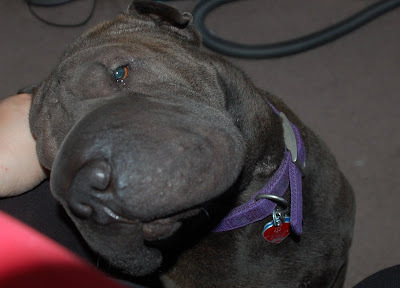 There was a note that said that's as close as a SHar pei will get to being underwater. How come she's not pee-mailing me? OK, I was finally able to get somepuppy to be a distraction. Thank Dog! I was worried about you guys. OK, It's been about a week and I'm still here with no sign of Mom or Dad. I think it's time I put my investigating nose to work and found a way out of her to go and find them. I might need some help. I have a few of the pups here convinced a break would be good. Queenie is in, Donny is in, a very dignified bulldog named Richard says he's in; Jimmy and Golden Retriever is really excited. OK. I'm going to need to get some you DWB guys to stat digging a hole outside the hotel, me and my crew will start digging from the inside. Or if we can have someone Ninja in to get the keys, that's be good too. So if all you wonderful diggers would contact me, I would appreciate it. Just leave a message on my blog and I'll post details soon. FINALLY! They still don’t have internet access in the rooms at this hotel, and I even brought my Barkberry. Sheesh. I was going to tell you all that I was having a good time here but then I read that Bogart's Dad has crossed the bridge. Please head to Bogart's blog and let him and his Mom know that we love them very much and we'll be there to support them. I'll write again when I can get another puppy here to distract the staff.